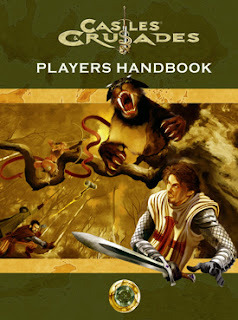 I recently read a couple of interesting articles on Trollish Delver and Grognardling discussing the use of Guilds which inspired me to go revisit the guilds for my own FRPG campaign world, The Lands of Dual. My first challenge (and one all GMs encounter) was to bring as diverse a party from the four corners of the globe together in as believeable a fashion as I could. I decided to use the scenario Challenge of Champions by Jonathon M Richards (featured in Dungeon #58) which called for the use of a Guild to host the annual competition. Thus was born the Adventurers Guild of Ayfal. 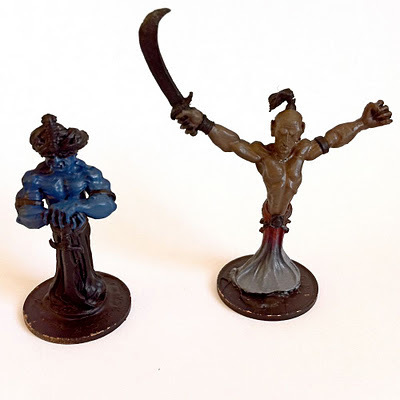 "In Darkness Find Rich Reward"
Catering to the needs of the discerning traveller, the membership of the Ayfal Adventurer's Guild is an eclectic mix of Warriors, Wizards, Priests, Bards, Rogues and other occupations. Guildmaster Fenwick - A middle-aged Priest has led the Guild for the last 5 years and his greatest achievement has been to expand the welfare services that the Guild offers. The Guild is well received among the townsfolk of Ayfal and they enthusiatically support the annual Challenge of Champions contest and the increased trade it brings to the town. Banking - Money (or valuable items) can be left with the guild in it's secure vault and withdrawn at a modest 5% fee. Depositors are required to give instructions on what to do with their funds in the event of their death. Guild Secretary Ignatius handles all banking transactions. International transactions are also possible through the use of "letters of credit" which are accepted between affiliated guildhouses. Boarding House - Limited lodgings are available on a first come first served basis and the guild has arranged members discounts at several hostelries within the town. 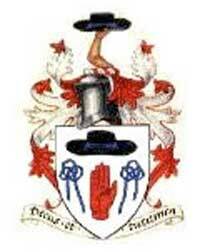 Employment Services - The Guild acts as an employment agency for many of the other guilds and organisations such as the Town Council where tasks of a questing nature are concerned. However, the Guild has a strict policy of not accepting tasks which involve the intimidation or assassination of town or guild officials. At breakfast each morning Guild Secretary Ignatius reads out the list of quest opportunities. Hospital - The Guild has several staff priests well versed in the medical arts and it's multi-faith membership ensures that last rites can be performed correctly irrespective of race or denomination. Procurement of Supplies - Superior quality adventuring supplies can be purchased through the Guild's Quartermaster at a reasonable rate (+10% cost above normal) and the Guild has arranged a generous membership discount scheme with local suppliers such as smiths, jewellers, tailors, corsers, and cartwrights. Training - The guild employs a team of veteran members in order to pass on their knowledge and skills to younger members. Library - The Guild has a well stocked library run by Guild Loremaster Ehnid who employs several scribes, clerics and cartographers to undertake research into ancient myths and legends and his pet project the cataloguing of creatures and monsters into the Guild's own Bestiary. The Ayfal Adventurer's Guild is unusual in that it is multi-class in nature, accepting members from all the major character classes. Each career class should have a "guild" of its own dedicated to the furtherance of their own particular talents although in some cases these may not be structured in the same way as in the example above. Organise Crime - function as an industry regulator, ensuring that the overall level of crime does not escalate to a point at which the local law enforcement would attempt to increase their arrest rate and to ensure that unregulated thieves do not practice within the city limits thereby protecting their members incomes. Legal Services - including the provision of bail funds, legal counsel, patsies and corpses when members are inevitably caught, tried and possibly even executed. Benevolence and Welfare - thieves guild members may use part of their share of any loot to fund a welfare scheme to provide for their children and wives if they are incarcerated or killed. Fencing - ensuring that stolen goods are quickly converted into cash through a network of related tradesmen and merchants. Racketeering - some scams or rackets can only be successfully operated with access to a large network of skilled individuals. Support Services - some jobs require access to equipment such as forged documentation or disguises. Others require detailed plans of municipal buildings which can only be acquired from certain city planners. Employment - ensuring that members have steady work and incomes commensurate with their skills or disciplines. Usually this takes the form of "promoting" members appearances in the taverns, theatres and other performance venues which exist in large towns and cities but also by forming travelling companies which travel from village to village in the lands between them. Library - each guild will have access to thousands of pages of prose, verse, lyrics and music which any member can access in order to expand their repetoire or to assist in the creation of entirely new works. Members are encouraged to transcribe their creations and are rewarded with performance rights or credits when other members perform their work. Training - members are regularly assessed to ensure that their performance skills are maintained at as high a standard as possible and tutors are available where performers need instruction and assistance when learning new techniques, instruments, disciplines or material. Licensing and Protectionism - unscrupulous inn keepers and venue owners are kept in check by the guilds licensers, ensuring that venues pay performers the appropriate fees. Performers can also avail themselves of bodyguards or escorts when playing venues in some of the less salubrious parts of a town or city. These bodyguards are often called to perform enforcement services when venues fail to pay their acts. Instrument Makers - Luthiers and other instrument makers are generally not populous enough to warrant their own guilds and the functions of quality and cost assurance and regulation therefore falls to the bardic guilds. Members will be able to commission appropriate craftsmen to fashion and repair instruments at fair and reasonable prices whilst the craftsmen enjoy the benefits of a steady steam of customers and the odd celebrity performer endorsement. Power Control - ensuring that access to knowledge of spells and their components is controlled to restrict the development of uncontrolled and destructive power. This may take the form of a hierarchical self regulatiing organisation such as a wizards college or in more extreme cases by the state or government using a system of registration and examination. These organisations may also be responsible for the licensing of magic shops or vendors of mundane items which may be used in the practice of the magical arts. Procurement - many spells require components which may be difficult or costly to procure. A guild may control the supply of these components or may even fund expeditions to source and recover or harvest them. The existence of proscribed spells may result in certain components appearing on "banned lists" and either the guild is responsible for controlling their supply or actively engaged in acquiring these items on behalf of its members. Library - new spells and magical techniques will need to be recorded for the benefit of other scholars or practitioners. Members may be actively encouraged to register new spells with the guild or if a competitive scholarly structure exists to publish their findings for peer review and adulation or advancement within the ranks of their organisation. Training and Apprenticeship - the magical arts take years to master and there really isn't any alternative to the apprenticeship system. Schools and colleges may operate systems to locate, and test candidates for basic magical aptitude and then provide training until they reach the level when they can be apprenticed to a master magician. Warrior Guilds - These may exist in many forms from the gladiator schools such as the Ludus Magnus of ancient Rome or dojo specialising in specific weapon forms or unarmed fighting techniques. The specific membership recruitment techniques of the guild can also vary from the lowliest slave fighter, to the wealthy merchants and gentlemen members of fencing clubs. Tournaments - the guild's primary means of income generation outside of any membership system will be to regularly hold contests or tournaments which demonstrate their members prowess. These may range from gladiatorial contests (much like the roman colliseum) to organised boxing matches or illegal pit fighting against men or monsters or even a simple archery competition. Admission revenues may be supplemented (or more likely eclipsed) by gambling revenues, although this largely depends on the type of event, patronage and the local view on the legality of gambling. Employment and Recruitment - wealthy merchants (and in some cases the state) will always need bodyguards to protect their persons and establishments and who better to supply them than the guild. Some governments may even use the guild as a front for recruiting fresh soldiers to fill out the rank and file of their army. Training - the type of training on offer will largely depend on the theme of the school. It could be as simple as churning out capable swordsmen or wrestlers for entertainment at public venues or it could be dedicated to teaching the swordcraft of a single weapon. Medical Benefits - fighting in any form will likely leave you with wounds at some stage and the medics of the guild will be specialised in patching up their members ready for the next bout. They may employ underhand or illegal means to do this such as magicians or alchemists and it is unlikely that they will be able to cure chronic illnesses, disease or poisoning. Some classes do not lend themselves to guilds in the traditional sense, but may instead be constructed around fraternal or religious lines. Clerics, Monks and Paladins - their faith is their guild and their temples or shrines their guildhalls, although Monks may be aligned to a particular fighting school and it is through the application of their fighting technique that they achieve a zen like state, enlightenment or may commune with their Gods. Knights - swear fealty to their King or Baron and do not seek out the brotherhood of other knights unless they are compelled by their code to seek out a common cause. Less scrupulous knights may engage in tournaments for sport or financial gain but are unlikely to join or form organisations unless it satisfies their chivalric duty. 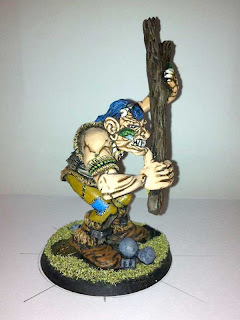 Racial and Ethnic Guilds - Demi-human or humanoids such as Dwarves or Elves may form fraternal guilds out of a common need to support their "own kind" or to preserve or practice aspects of their culture. Humans from other nations may also band together under a common nationality in order to further their own cultural goals or to present a united front when engaging with a nation state where they may be a cultural or ethnic minority. Occupational and Mercantile Guilds - The vast majority of guilds will be either occupational guilds designed to support the needs of a particular set of workers (skilled or unskilled) in the form of a labour union or mercantile guilds which control, regulate and promote their members business interests. More information on the history and structure of medieval guilds can be found on the website of the Economic History Association. Dragonmeet 2011 was held yesterday, as usual, at Kensington and Chelsea Town Hall in the heart London's upscale Knightsbridge. It's a good venue and is close to the traditional exhibition centre that is London's Olympi and Earl's Court venue's. Sadly in recent times the Tube Network has suffered from engineering works at this time of year and this year was no exception. That said there was a good turnout with around 1,000 gamers queing up outside efore the doors opened at 10am. The venue lends itself to an RPG convention as it offers multiple small halls and meeting rooms where gaming can be broken up into collections of tables thereby keeping the volume levels down so you don't have to strain to hear or be heard. The ground floor foyer was predominately reserved for boardgames with just one trade stand, the rest being contained in the large auditorium. The upper and lower foyers and their respective halls being reserved for games tables covering a wide assortment of RPG, Board and Card games. The game sign-up table, located in the ground floor foyer was the usual chaotic scrum but I managed to get my name down on the game of Toon I wanted to play. Attending this con over a number of years has taught me to read the game announcements beforehand and to have at least one backup option should your main choice be full by the time you get to the sheet. I fondly remember the large full colour ads for this Steve Jackson produced game of cartoon mayhem, which graced the pages of White Dwarf in the mid 80s and it had always sounded interesting so I was quite keen to give it a go. We were playing the supertoons variant and our characters were appropriately named "Defenders of Toonsville" comprising of myself as THE WEIRDO (a purple alien made of rubber), RABBOT GIRL a robot rabbit girl with an OCD for tidying, MAGIC-I-AM a stage magician with a big bag of glitter, S.C.A.T.MAN A bebop jazz fanatic with an NSFW name and last but not least the scourge of toonsville's criminals, WONDER WABBIT. 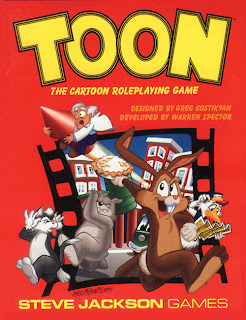 The first scene called for our caped cartoon crusaders to find and defeat the evil villain known only as THE DE-ANIMATOR who's dastardly plan was to use goons equipped with de-animator guns to blast the citizens of toonsville, robbing them of colour and turning them into mindless zombies. The goons had arrived in an egg shaped spaceship which we managed to pilot back to his gothic castle in the desert where I used a plot point to "pull the plug" on The De-animator's plan quite literally by pulling the plug out of the vat containing the black ink which made up his body. The game system was simple and easy to pick up lending itself to con or one-night game play rather than any serious campaign play. I found it both fun and intriguing to play as you really have to keep up with the action in the scene or your next action won't contribute to the zany plot. For example in one scene my character, THE WEIRDO, teleported into a corridor where a light was rapidly approaching with a clickety clack sound (clearly a train), as I had the shape change ability I changed my mouth into a tunnel entrance and promptly ate the train. Later in the final scene when I was been grasped in one hand by a now giant sized De-animator with no means of fighting back, I opened my mouth and let out the train, punching him in the eye. I suspect that this is quite challenging to GM as you have to be very flexible and receptive to your players ideas. I liked that the GM (John Wilson) gauged the success of any particular idea by the volume of laughter around the table and awarded plot points accordingly. These Plot Points are pretty crucial to the game system as they allow you to produce items, re-roll dice and generally influence the plot and result in some very funny situations. I shall definitely be playing Toon again and it makes a welcome change from the traditional Sci-Fi and Fantasy RPGs I normally GM and play. Having run my first C&C campaign for over 30 sessions now, I thought it was high time I played in a game partly to see if my GMing of it was up to scratch and partly to play an FRPG I was familiar with in a con setting. Unfortunately I arrived at the table last so had the Hobson's Choice of pre-generated characters, a 1st level wizard. I hardly ever play wizards so this was going to be challenging. The scenario was GM'd by Gareth Larter (who also happens to be the Dragomeet Webmaster) and I was pleasantly surprised that he had also chosen to abandon the (IMHO) overly restrictive Vancian magic system in favour of a spell slot style system. The Beacon at Enon Tor was a dungeon crawl in and around a large tower on a cliff-side promontory which acted as both a lighthouse and a wizards laboratory. The concerned townsfolk had hired the party to find out why the fog horn had been blaring for two straight days (long after the fog had lifted) and then had suddenly stopped. I have always felt that I made a poor tactical player, and an even worse wizard. 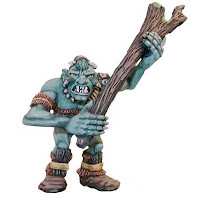 However, in this game I ended up playing extremely tactically, particularly in the use of a simple hold portal spell to prevent the escape of an orc and to get the drop on a bugbear. Perhaps my recent campaign sessions watching my own players struggle in tactical play has had an effect on me, I don't know, but I really enjoyed the game as a consequence. The rest of the players also enjoyed themselves and at least one descended into the dealers hall to try to pick up a copy of the PHB. Sadly this year there were no goodie bags stuffed with freebies and all the trade stands seemed to have shrunk somewhat in the volume and variety of games they brought to sell. Perhaps this is sign that the industry is in recession or more likely that it's customers disposable income is shrinking and dealers are responding to this. Unfortunately my game schedule meant that I was unable to attend many of the peripheral events such as the Discussion Panels from the attending industry celebreties such as Ian Livingstone or the aftershow auction. Nor did I manage to take any photos this year, however Big Lee has put up a few of his photos on Big Lee's Miniature Adventures which give you a taste of the atmosphere and scale of this event and I recommend that everyone who is a London based gamer should aim to visit next year. Irrespective of your particular flavour of FRPG the Gold Piece is one of the defacto fantasy standards, and is accepted the world over (whichever world it is that you play in). The implicit reliance on a Gold Standard, the intrinsic value of gold itself, means that a GP acquired in one nation has an equivalence to one acquired somewhere else ensuring trade is not stifled and that PCs can still buy what ever they need irrespective of what nations coinage they choose to use. 1. Gold is Commonplace - The Gold Standard only really works because gold is rare and therefore valuable. In a society where gold is commonplace its value will be reduced and some other rare commodity will take its place. This concept is explored to a degree in post-cataclysm Dragonlance where steel currency replaces gold. 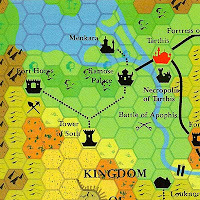 However, this is the case throughout Krynn rather than just single region. Consider a party visiting a nation which has access to vast amounts of gold (like the conquistadors encountering the Atecs), the PCs will no doubt struggle at first and will need to convert their existing wealth into whatever is used as the local currency. Greedy PCs might try to exploit the difference in commodity prices by frequent trips across the border which could bring them to the attention of local law enforcement or worse border bandits. 2. Not Legal Tender - Imagine that two bordering nations are in dispute over something or other and their respective governments refuse to accept their neighbours coins as legal tender. A coin minted in one nation does not automatically become worthless on the other side of the border, as it still has an intrinsic value thanks to the gold standard, it just becomes really hard to spend it and stay the right side of the law. Local law enforcement may be on the lookout for strangers trying to infiltrate or subvert the locals with coins from across the border. PCs may be forced to turn to the blackmarket in order to buy simple provisions. They could even be approached by criminals offering to launder or re-mint their illegal coinage for a fee. 3. This gold's been watered down! - We've all seen those pirate movies where a character tests a coin by biting into it. This crude form of assaying tests that the coin has the correct amount of gold in it, but if a nation state changes the amount of gold in its currency this be reflected in the gold standard for that currency. For example Nation X is going through tough times financially and its unscrupulous leader decides to change the gold content in the GP it mints. Everything goes swimmingly until import prices start to go up and the population is in revolt. Enter the PCs with a fat wedge of foreign "pure" gold and suddenly the corrupt local sherrif is looking at ways he can relieve them of their burden and smelt it down for a fat profit. However, the local sherrif might be the least of their problems if the Thieves Guild's coin clippers and forgers find out that they're loaded. 4. Ripped Off! - Wandering into a town over the border can get PCs into all sorts of trouble when they are trying to spend unfamiliar coin with the local merchants and their chances of getting ripped off increase dramatically. 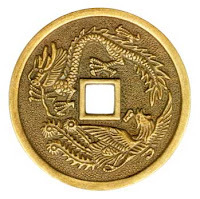 Any difference in size or shape of a coin will result in differences in the coins value and exchange rate. One nation's GP might be twice the thickness of anothers and therefore worth twice as much. The first time they get a handfull of change, they might be pleasantly surprised or falsely accuse a merchant of ripping them off. 5. Accused of Forgery - The Gold Standard ensures that the intrinsic value gold is preserved but that doesn't mean that the local merchants gleefully accept foreign coin and trust it like their own. 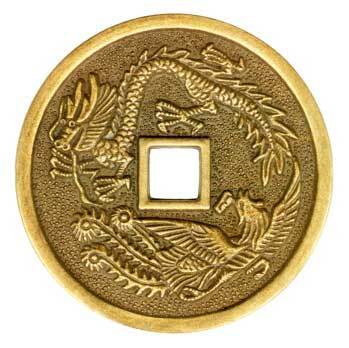 They might try to take advantage of the situation and accuse the PCs of forgery, particularly if they are using coins acquired from a distant land and not a neighbouring one. If the case goes to trial the local magistrate may be in on the swindle. This is also where an Adventurers or Merchants Guild can provide a valuable service to its patrons by operating a coin exchange program, for a fee of course. This plant is only ever found in subterranean locations and therefore does not rely on sunlight for energy, instead it has evolved a mechanism to secrete a highly acidic enzyme from its tendrils which breaks-down the soil and rock to release minerals which it then consumes. Once the plant has grown to a huge size its energy needs soon outstrip it's surroundings and so it sends out its tendrils to find new sources of minerals, eating through solid rock and anything else which stands in its way. The plant often encounters small quantities of Gold within the rock it consumes which solidify and become trapped within the plants heart like gall stones. Although the majority of its diet is made up of processed rock, it is actually omnivorous in nature and equally suited to extracting nutrients from other plants or animals. This unusual feeding mechanism also provides the brain vine with its only defence mechanism. When attacked the plant exudes a cloud of acidic poison gas for 1d4 / 1d6 or 1d8 rounds (depending on the size of the plant). In the first round the gas cloud has a radius of 10ft and expands by 10ft each round after that. The gas causes all creatures within the cloud to suffer 1d6 damage unless they make a save against poison. 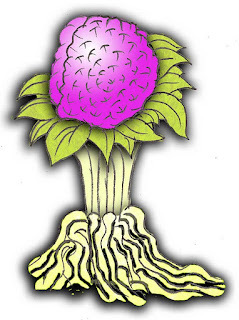 It is especially vulnerable to strong sunlight which causes any exposed parts to wither and calcify and is pale white yellow in colour topped by a purple-pink fruit resembling a giant brain, hence the name. PCs may confuse this growth as evidence of an evolved intelligence however this is not the case and the brain vine has only a plant-like intelligence. The brain vine is asexual and once it reaches adult size produces a single seed every 2 years. 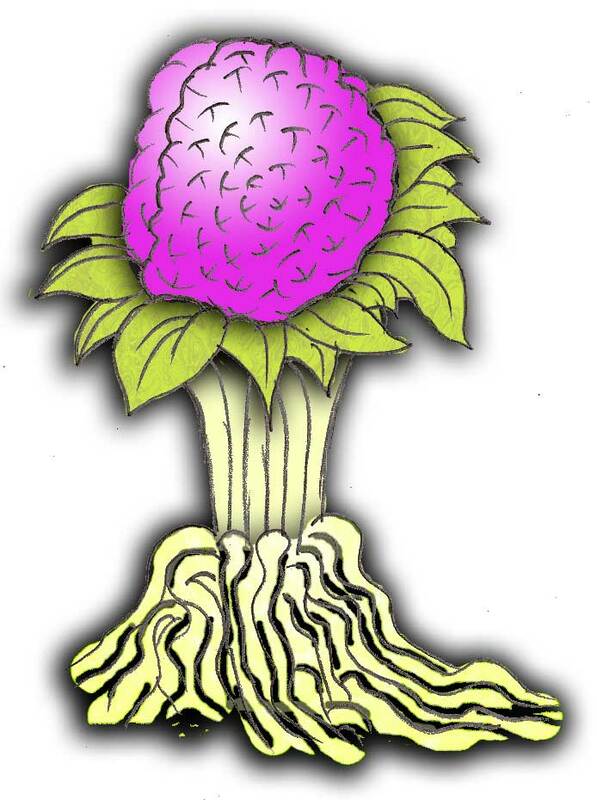 This seed is contained deep within the fleshy brain fruit and resembles a spiky rugby ball. When planted the seed grows quite slowly taking 1 year to germinate and grow into a Young plant (Medium size), 2 further years to grow to a fully grown into an Adult (Large size) and a further 5 years to mature into a Great Brain Vine (Huge size). A Great Brain Vine can live upto 5d6 further years before it will wither and die. These human sized fungal plants are an entirely seperate species which have evolved a symbiotic relationship tending to the Brain Vine and feeding off its decaying plant material and any other plants which inhabit its underground ecosystem. They are of low intelligence and appear to communicate with each other by releasing fungal spores from the pustules covering their bodies which they inhale through their tendril covered mouths. 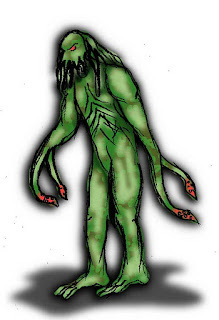 They are a mottled green colour, vaguely humanoid and each armlike appendage ends in two tentacles covered in vicious barbs. Fungaloid lurkers are immune to the Brain Vine's toxic gas. They are fiercely territorial and interpret anything that is not either another Lurker or the Brain Vine as a threat to the survival of their colony and they will attempt to grapple their prey to the ground and use their barbed tentacles to macerate the flesh in order to bleed it dry. They will then feed the remains to the brain vine's tendrils and consume whatever is left behind. They are relatively quick to grow to maturity but the size of their colony is entirely dependant on the size of the Brain Vine plant that they tend. A young Brain Vine can support a colony of 15 Lurkers, an Adult Brain Vine supports upto 30 Lurkers and a Great Brain Vine supports upto 45 Lurkers. When a Brain Vine dies the Lurker population will consume the remains of the vine and then plant a vine seed in its place (if one is available). Once this process is complete they will consume each other until only a handful are left in order to tend the immature plant. As the vine grows in size more Lurkers will be created and so the cycle is repeated. You can also download a free sheet of standees for use in your own adventures from RPGNow. 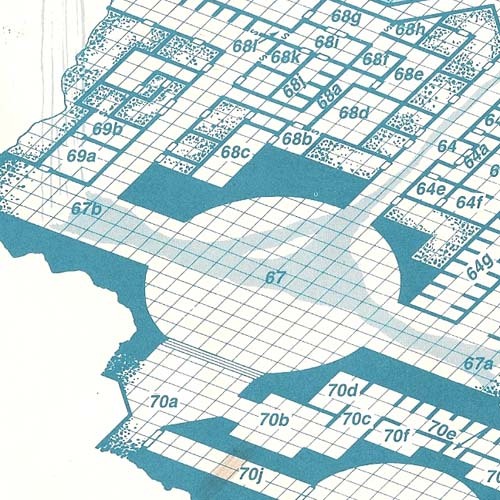 One of my favourite AD&D campaign settings is Al-Quadim: The Land of Fate and I've used the odd scenario or module on numerous occasions in my own campaign world. I picked up these two Ral Partha minis as a blister pair at least 20 years ago and I've had several abortive attempts at painting the Djinn (the turban wearing guy on the left) but never touched the Efreet. Hopefully this time (with an audience) I can push myself all the way to the finish. Here's an updated shot after the efreet had a little accident. His blade bent and snapped off... Guess I'll have to do some sort of fix, but not sure what yet, the blade is too thin to pin so perhaps I'll have to build something up in milliput as a replacement. I do however like how the skin and face came out. I'm also trying to work out how to blend from red to white on his trousers to make it look like he's rising out of a pool of smoke. This is the Golden Demon Germany 2011 Slayer Sword winning diorama and there's not much more you can say apart from... OMG! A chaotic neutral character follows his whims. He is an individualist first and last. He values his own liberty but doesn't strive to protect others' freedom. He avoids authority, resents restrictions, and challenges traditions. A chaotic neutral character does not intentionally disrupt organizations as part of a campaign of anarchy. To do so, he would have to be motivated either by good (and a desire to liberate others) or evil (and a desire to make those different from himself suffer). 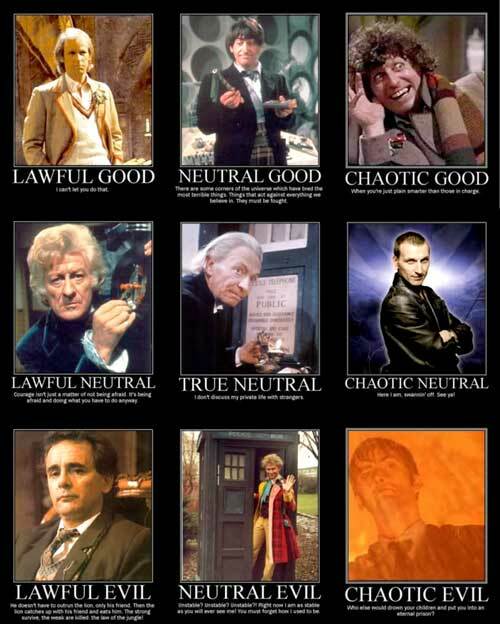 A chaotic neutral character may be unpredictable, but his behavior is not totally random. He is not as likely to jump off a bridge as to cross it. Chaotic neutral is the best alignment you can be because it represents true freedom from both society's restrictions and a do-gooder's zeal. However, chaotic neutral can be a dangerous alignment when it seeks to eliminate all authority, harmony, and order in society. In the late 70's the New Wave of British Heavy Metal (NWoBHM) was unleashed across the airwaves and in dingy pubs and clubs all over the UK. Spearheaded by bands like Iron Maiden, Motörhead, Saxon, Judas Priest, and Venom who, although they had been inspired by the largely educated and middle class Progressive and Heavy Rock bands of the late 60's and early 70's, were unashamedly working class and many originated in the industrial towns of the Midlands and North of England such as Birmingham and Sheffield. Teenage rebellion usually goes in search for something that will annoy the heck out of your parents and NWoBM was just waiting to be discovered. The music was a mix of piercing and wailing vocals, thumping bass and drums and a shredded guitar sound like an angle grinder on steel. The album covers often featured Fantasy or Sci-Fi themes and the band logos (often using vaguely occult typography and symbology) were worn as patches on your sleeveless denim jacket like some sort of tribal brand. You wore your greasy long hair like a viking marauder and bullet belts and studded bracers were all part of the genre uniform. The literary tones of Sci-Fi, Horror and Fantasy were evident in much of the lyrical content of earlier progressive bands such as Hawkwind and Black Sabbath and this influenced many of the later Metal bands to cover these genres. 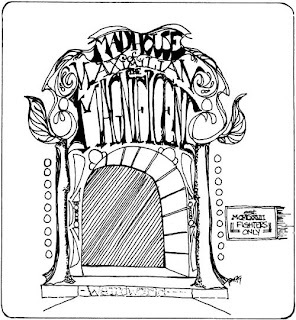 On Iron Maiden's album "The Number of The Beast" the track "Murders in the Rue Morgue" was directly influenced by Edgar Allen Poe's novel of the same name, "Children of The Damned" influenced by John Wyndam's "The Midwich Cuckoos" and "The Prisoner" influenced by the cult TV Show of the same name starring Patrick Magoogan. 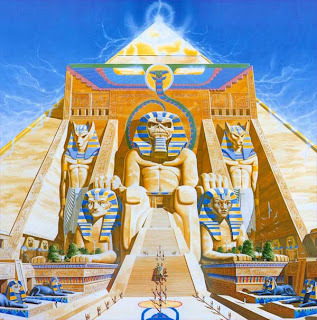 Just to prove a point Maiden famously did a 13 minute rendition of Samuel Taylor Coleridge's "Rhyme of the Ancient Mariner" on the 1984 album "Powerslave". 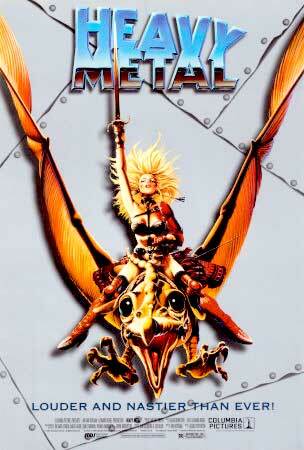 This has to be both my favourite Maiden album and my favourite Derek Riggs cover. I spent a lot of time staring at that album cover and if you look closely at the hieroglyphics you'll also see some graffiti from "Indiana Jones", "Mickey Mouse" and the British "Chad" a version of "Kilroy was here". 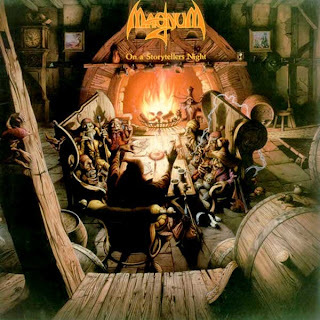 Other artists like Saxon had tracks such as "The Warrior" which portrayed a generic fantasy storyline. 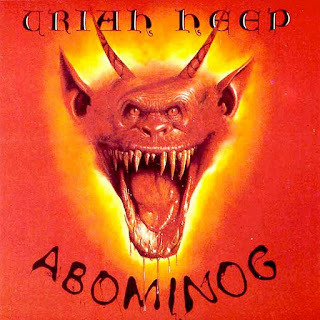 Of course Metal wasn't a peculiarly british phenomenon and US bands such as Metallica famously covered HP Lovecraft in the tracks "The Call of Ktulu" and "The Thing That Should not Be" and New York Thrash Metal band Anthrax covered 2000 AD's Judge Dredd in their song "I am The Law"
One of the other big attractions aside from the music where the amazing works of fantasy and sci-fi art which adorned almost every album. 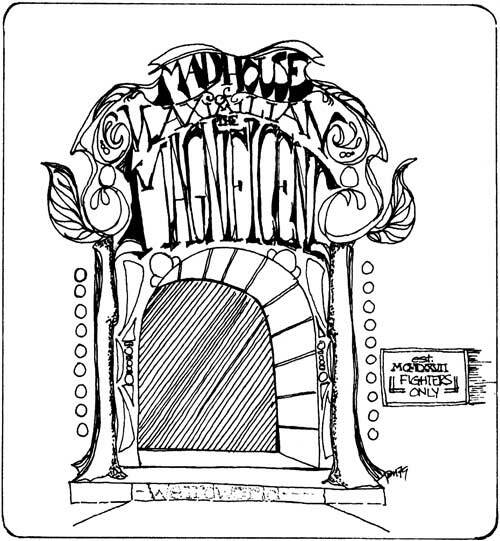 In fact it seemed that in addition to the standard lineup of drums, bass, rythmn guitar, lead guitar and vocals it was almost as important to find a great artist to design your band logo and album covers. A tradition begun in the 70s with prog bands like Yes employing Roger Dean and continued by Iron Maiden and their long (if not entirely harmonious association) with Derek Riggs. Joe Petagno has had a 31 year association with Motörhead and devised their famous "Snaggletooth" emblem which has graced many of their albums. Needless to say for every great piece of cover-art there were lots of awful ones which slipped through the net. A particularly comical one was that of Sweden's Yngwie "J" Malmsteen (pronounced Ing-vey) and his 1986 album "Trilogy". 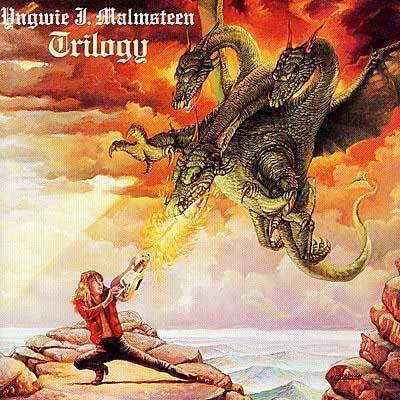 The impossibly posed neo-classical guitar-god Yngwie, is depicted seeing off a three headed dragon with what can only be described as "a fire spewing lick of his stratocaster". I'm sure everyone in the meeting thought it was a good idea at the time. In France in 1974 two comic book artists Jean Giraud (aka Moebius) and Phillipe Druillet began publishing a quarterly sci-fi graphic novel under the title Métal Hurlant (Howling Metal). These comic books were in a grphic novel format and featured distinctive and detailed artwork and strong storylines with adult themes it was picked up by National Lampoon, translated into English and relaunched in 1977 as Heavy Metal and in 1979 the format was changed slightly to include Rock Music reviews. With the release of an animated feature film Heavy Metal (1981), the combination of art, music and Sci-Fi/Fantasy stories was brought together in one vehicle. A combination of original storylines and a soundtrack featured tracks by a plethora of rock bands of the era such as Black Sabbath, Blue Oyster Cult, Cheap Trick, Grand Funk Railroad, Journey and Stevie Nicks it was every pubescent teenage boys fantasy brought to life. 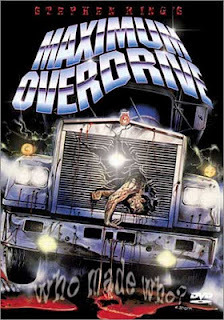 The 80s saw the use of Heavy Metal soundtracks in films particularly of the Sci-Fi Horror genre and led to AC/DC recording the soundtrack to the movie Maximum Overdrive (1986) written and directed by Steven King. The movie featured Emilio Estevez and a bunch of "survivors" as they are terrorized by an army of machines, led by a "green goblin" faced truck, which have been brought to life by the passing of a strange comet. The author also makes a cameo appearance in the movie as a bespectacled sunday driver. 1986 also saw Kiss bassist and tongue waggler extraordinaire Gene Simmons and rock legend Ozzy Osbourne appear in cameo roles in the horror movie Trick or Treat which featured a soundtrack by Fast Eddie Clarke (also famed for playing guitar on Motörhead's "The Ace of Spades"). 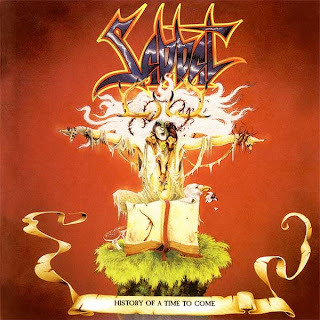 The plot plays heavily on the urban legend of satanic messages being heard in records when they are played backwards (Hey kids! I bet you can't do that with your Lady Gaga CD) and the spirit of dead rock star Sammi Curr's attempt to be ressurected through a Halloween Dance sacrifice. All good clean adolescent fun really. 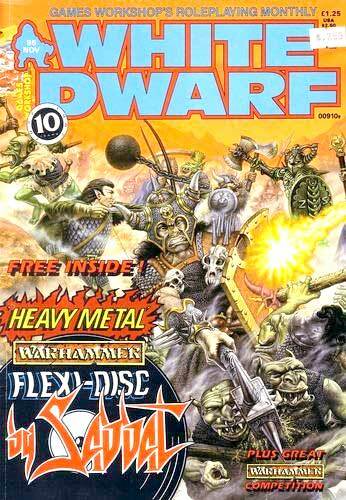 The association of Heavy Metal music with gaming reached a climax in November 1987 when Games Workshop's John Blanche conspired to give away Nottingham Thrash Metal group Sabbat's "Blood for the Blood God" as a flexi-disc single in issue 95 of White Dwarf. 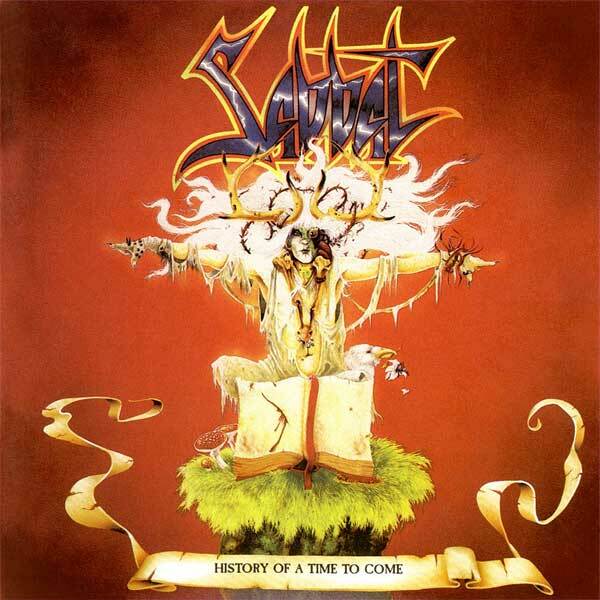 I was lucky enough to see Sabbat in '88 when they played London's Marquee Club (the Charing Cross Road incarnation) following the release of the album "History of a Time to Come"which also featured cover art by John Blanche. A great gig which introduced me to the art of stage diving and I swear I had tinitus for three days afterwards. Another Nottingham band to emerge in the late 80's in association with Games Workshop were Bolt Thrower whose name originated from the siege weapon featured in their Warhammer Fantasy Battle wargame. The cover of their 1989 album "Realm of Chaos" is the same painting by John Sibbick which graced the front cover of the original Warhammer 40,000: Rogue Trader rulebook. Today is American Censorship Day and although I am not an American Citizen I feel very strongly against this poorly drafted bill which has the potential to do more harm than good. Here in the UK we've already failed at preventing bad internet legislation from being passed in the form of the anti-democratic whitewash that saw the introduction of the Digital Economy Act (DEA). This law sought to create a situation where ISPs were responsible for actioning take down requests and for providing copyright owners with infringing customers account details without a judges court order or legal test to determine whether the content in question actually infringed anything. Truth be told the mechanics of the enforcement of this bill are in such a state of dissarray that no-one knows how to implement this new law. This has recently led to the issuing of legal demands by copyright owners to ISPs to block traffic to certain domains. The impact of course is that every domain everywhere is subject to the same potential action. If you give government the tools in law, sooner or later they'll use them. The SOPA is similarly well intentioned but poorly drafted and dangerous legislation and I urge you to contact your congressman/woman. You may well ask WTF has this got to do with RPGs? 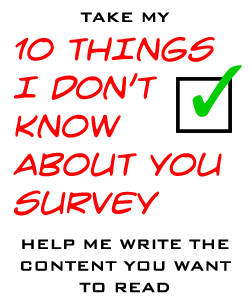 Well, just from a blogging perspective this means that you could be censored for a whole range of posts where your original content draws on themes from movies, characters, locations or even ideas or even sharing that link to a funny fan generated karaoke video. If the owner of the copyright deems that you've crossed the line, at best you'll be staring a DMCA Takedown Notice in the face with no recourse to "fair use" or "safe harbour" and at worst you could be facing a legal challenge and potentially a punitive fine. As a roleplayer I'm concerned that this legislation will ultimately damage our hobby and as a member of a democracy I am against the corruption of democracy by the money and power of "big business" for its own agenda against the will of the people. If you're like me and feel that we are on the brink of a cyberpunk dystopian future, act now before its too late. And here's a message from your Vice President Joe Biden. Yesterday I posted a progress photo of my first miniature painting project in rather a long time. Here's the finished miniature (apologies for the crap photography). I have been out of the miniature painting game for many years but as I've always found it to be quite stress relieving I recently decided to give it a another go, so invested in some new brushes and paints. 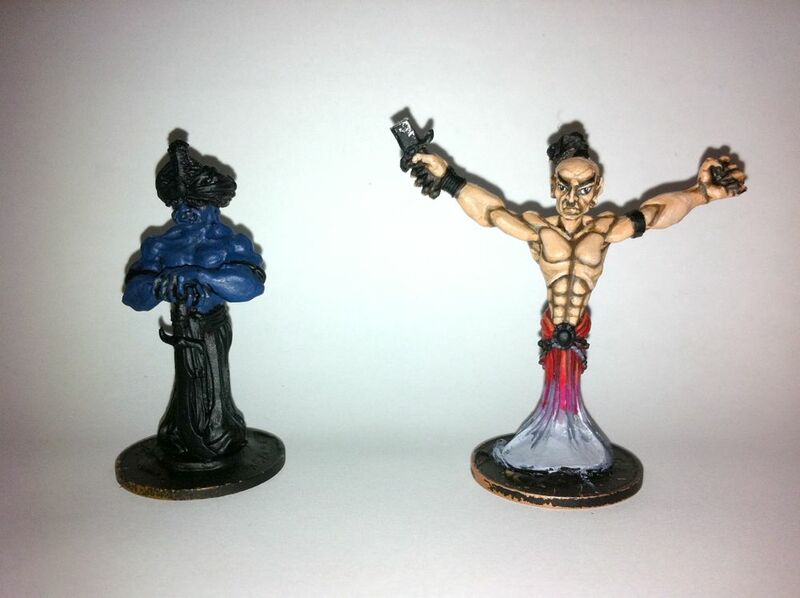 I hope that I can begin to put a dent in the large stock of unpainted miniatures which I have collected over the years. My first project is a Harlequin Miniatures Giant Forest Troll. 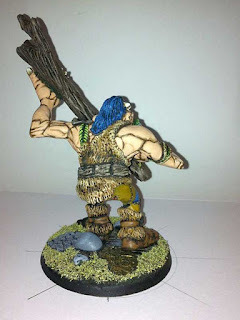 I was given this miniature many moons ago as a birthday gift and I had one abortive attempt at painting it soon after moving into my new home 9 years ago. The miniature is a multipart casting comprising of torso, legs and a huge log club which the troll wields with both hands. So the first order of the day was to de-flash the parts and then pin and glue them together with superglue. The gaps (and there are plenty) were then filled with milliput and textured. I then mounted the miniature to a Foundations of War 60mm Round - Battlefield Debris Base and sprayed it with black primer. I never liked the painted image on the box lid as it was far too troll-like, so I decided to make mine a bit more generic so it could serve equally well as a giant or a giant ogre. I use Miniature Paints (the ones in the little glass bottles), they're cheap and have a reasonable consistency and don't seperate too much unlike other paints I've tried in the past. My painting style is to build up layers of colour from a black base getting gradually lighter and lighter and I find that this gives a good balance of detail at a stand-off scale, particularly when you are painting a bad casting. I usually paint the face first to give me a guide to the rest of the figure and then block out the large areas of skin and clothing in darkest shades. 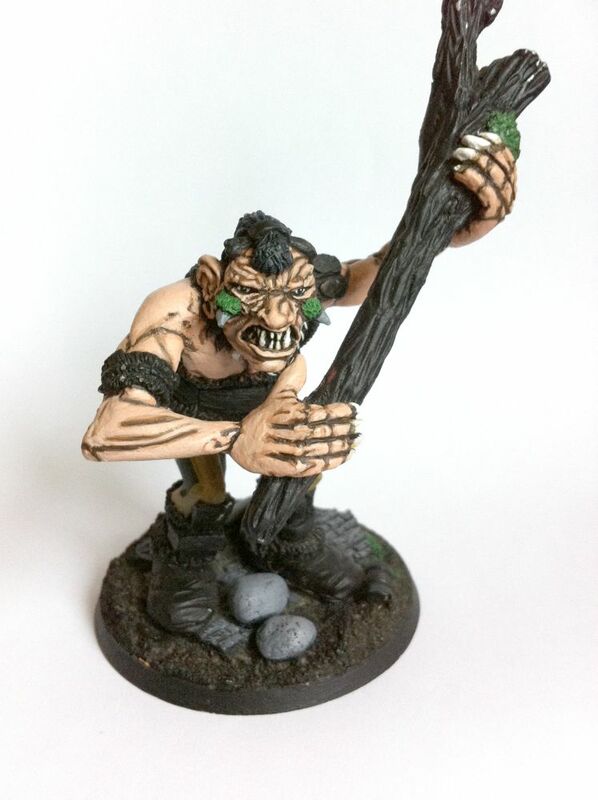 With this miniature it was almost 30% painted to begin with but I wasn't happy with the skin tones so I decided to paint all the skin first. 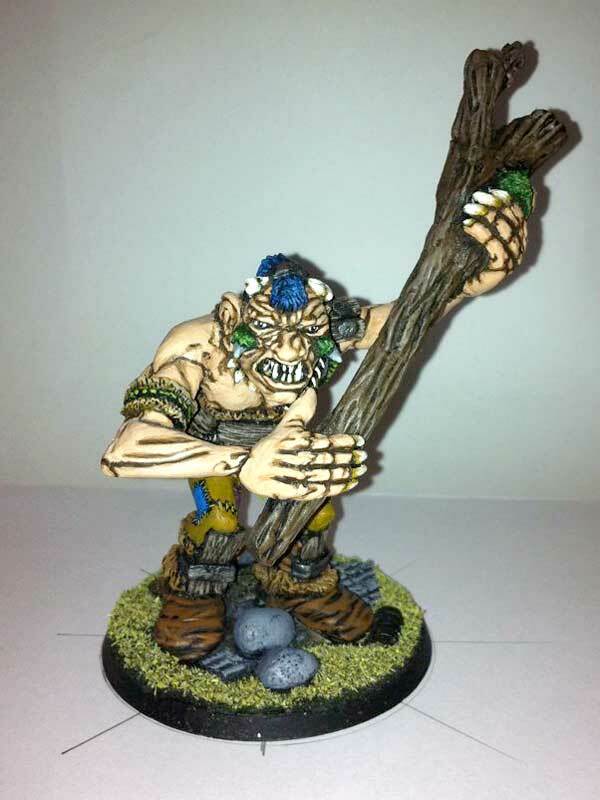 The giant troll is wearing a sort of animal skin toga which barely covers its bum but the painted example on the box shows no trousers. Clearly this creature is fashion concious ( and enough of a seamstress to sew an animal hide toga) so I decided that it wasn't going to be comfortable without trousers. These I'll paint as a patchwork of different smaller pieces of cloth which it has clearly picked up off the battlefield (including a rather fetching red gingham tablecloth). 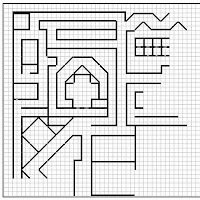 In part 1 and part 2 of this series I looked at Battlemaps and Dungeonmaps which conventionally use a square grid. 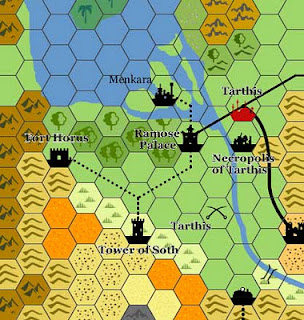 Now I zoom out a little bit more and look at options for Regionmaps and enter the realm of the hex. 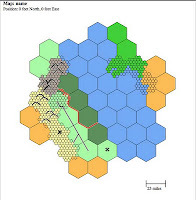 Regional maps use a variety of scales, my own maps use a notional scale of 1 hex = 50 miles. 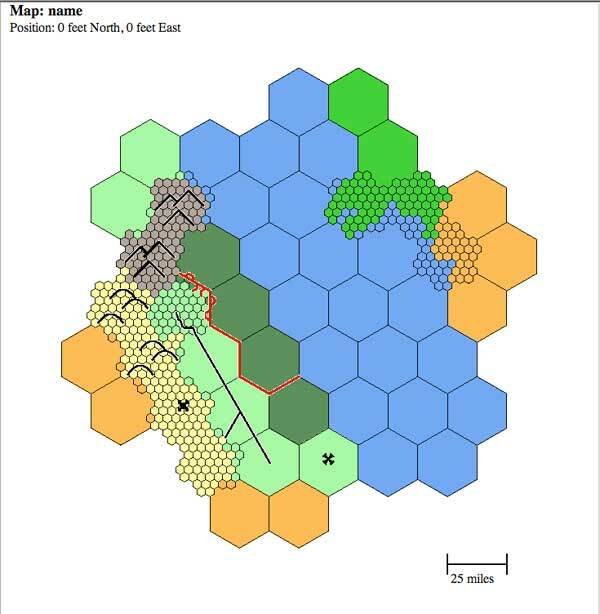 Erin Smale over at Welsh Piper has done some amazing work with a trio of hex templates which you can download in PDF and Hexographer format which use, 125 mil, 25 mile, 5 mile wide scales. Welsh Piper also has articles about demographics and campaign building for a low fantasy campaign and comes highly recommended. However, the purpose of this series of articles is to explore and evaluate the free (or as near as free as it gets) software tools available to the budding cartographer, and for the purposes of demonstration, I will be using a sample from TSRs HRW2 Kingdom of Nithia a Hollow World sourcebook and the usual 1½ hour (or thereabouts) timelimit to see what is possible. 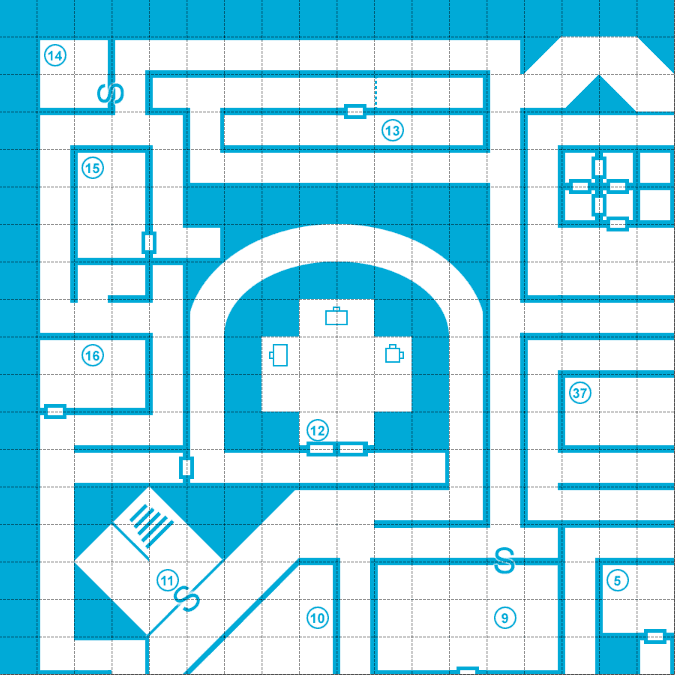 A free Java based map editor (There's also an offline Pro version available for $24.95) which comes complete with the majority of icons you will find on a standard TSR map. I have had trouble running this software before on my mac which is notorious for its Java implementation but a quick look in the support forum got me the answer I needed and I was up and running in no time. The interface is fairly self explanatory and after a bit of trial and error got some great results on the Hollow World map. I particularly like the option to fill the bottom half of each hex for the "features" such as towns and cities which is so characteristic of the TSR style of regional maps. 9/10 - "Almost Perfect"
Not to be confused with Hexmapper, is an interesting Java application which focuses on a single hex and allows you to drill down to smaller and smaller scales. Unfortunately the interface is a little cumbersome and there's not much of a manual to go with it. The colourset the tool uses is roughly similar to that of the sample map, but there is a limited amount of terrain choice and icons to depict settlements. I'm sure that given more time I could make a good looking detailed map as I learned how to and when to use the various tools. I especially liked the line drawing functions but it wasn't enough to keep me interested enough to persevere beyond the time limit. 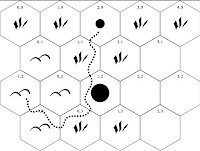 4/10 - "Interesting... but no more than that"
An interesting project from Alex Schröder which generates black and white wilderness hexmaps from ASCII input. Although it seems simple on the face of it getting the syntax right can be a bit of a challenge and there aren't many feature options. As an exercise in ASCII to Hexmap it's a bit of fun and I expect it was more of a development challenge than an attempt to create something genuinely useable. One thing I did like was the oriental caligraphy aesthetic which was most pleasing on the eye. 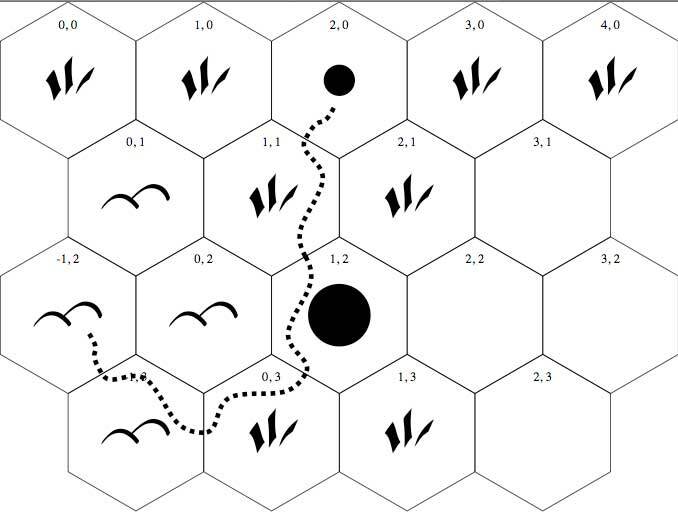 2/10 - "because Alex could..."
As its name suggests Wildgen is a random hex terrain generator and is an excellent resource for the time-poor DM. It just generates the base terrain and there's no options to edit or add features such as settlements or roads, but if you are world building in a entirely random fashion it may have some uses. I was quite surprised that there aren't that many options out which are cross platform bar the excellent hexographer (which has been around for a while). Perhaps there are some enterprising HTML5 developers out there who feel like a challenge? 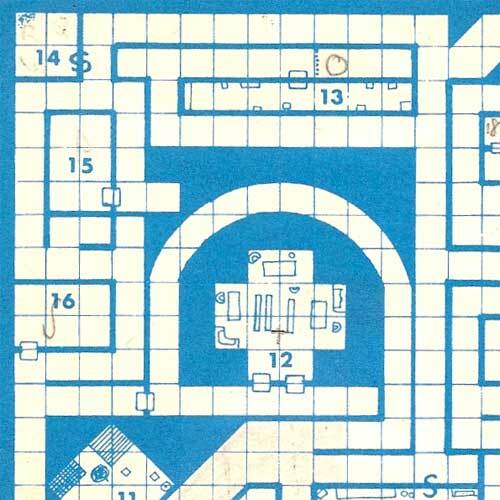 As I've said earlier I started roleplaying in the 80s with Tunnels and Trolls and then gravitated to AD&D (1e) but my first experience of Sci-Fi roleplaying was as a player in a Traveller campaign. Although I never owned the LBBs (Little Black Books) or the boxed set I did (and still do) own a copy of Double Adventure 1: Shadows / Annic Nova. At this time White Dwarf was still covering all RPGs and regularly featured scenarios for traveller, a favourite of mine being "The Sable Rose Affair" featured in WD 17. I loved the hard edge that traveller put on the whole Space Opera genre. It wasn't so much about racing through the galaxy to rescue the princess, it was about dealing with the day to day minutia of staying alive in the cold depths of space and yet trying to eke out a living and possibly making that big score. In other words more "Alien" than "Star Wars". 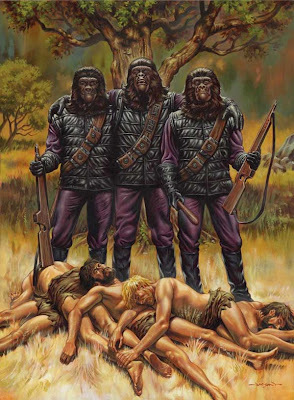 Believe you me, this was hugely influential to my 11 year old self whose Sci-Fi diet at that time was limited to Doctor Who, the odd episode of Blake's Seven, Battlestar Galactica and re-runs of Lost in Space. 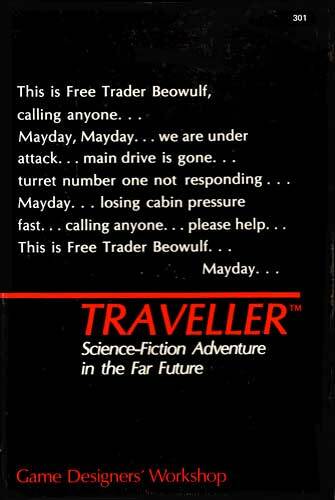 Traveller also heavily influenced one of the breakthrough 8-bit computer games Elite by David Braben and Ian Bell which I spent many hours playing on my school's only BBC Micro. In 1984 GDW released Twilight 2000 which focused on the plight of the survivors of WWIII assembling their rag tag militas to fend of the remnants of the soviet army. This got quite a bit of play at the club I was a member of at the time, but it never fit in with my cold war childhod as I recall most of the scenarios being set in the US. Towards the end of the decade GDW released Space: 1889 which in hindsight shows how groundbreaking GDW were when they published the first victorian Sci-Fi RPG before cyberpunk had truly emerged never mind steampunk. In recent years I have come to enjoy victorian sci-fi more and more, partly as a refracted, quintisentially English, vision of Empire and partly as a result of my fascination with the aestetic of heavy engineering during the industrial revolution (with brass finials and plenty of scroll work). In the first part of this series I explored the free options for Battlemaps. 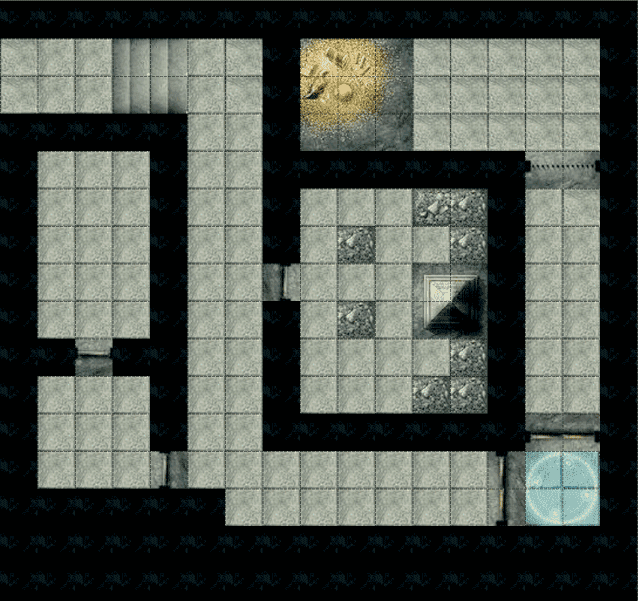 In this part I up the scale slightly to look at Dungeon Maps. 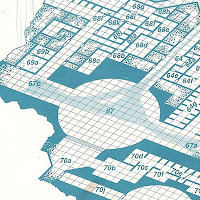 These usually conform to the scale of 1 square to 5ft and come in a variety of styles from the original D&D module "Blueprint" style to isometric maps for complex multilevel dungeons. 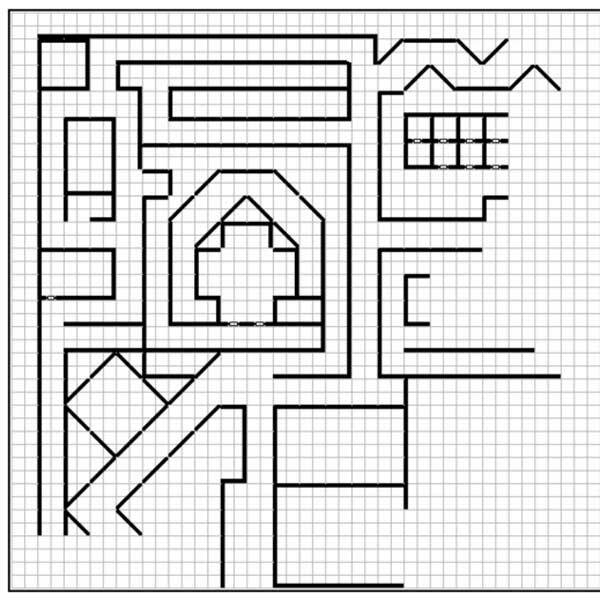 For the purposes of comparison I will attempt to recreate small sections of maps from each of the TSR modules B1 In search of the Unknown (a 2D map) and DL1 Dragons of Despair (a 3D map). Again I am restricting myself to only using free tools or web based apps and from start to finish each map should take no more than 1½ hours to create. Free to use 3D modelling application (Windows/Mac OSX) which has a 2d export function. First thing, make sure that you position the camera to be facing the "Top". 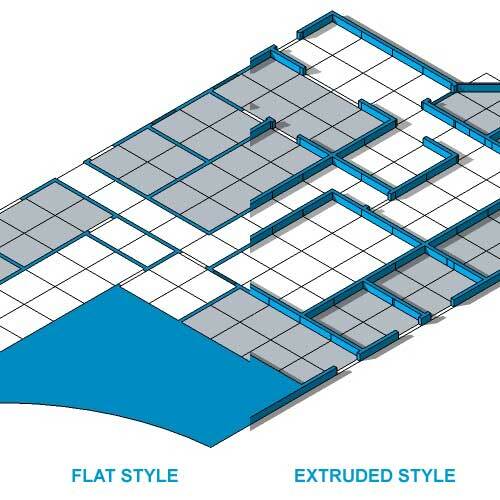 Then you can start off by creating a grid (Sketchup is very flexible when it comes to unit measurement so if you want to create 5ft grids do just that, using the appropriate template) it is possible to use the draw line function to draw in all the floors doors and walls. Sketchup is always trying to fill enclosed shapes, so bear this in mind and make sure that when you close a shape you either delete or fill the "face". 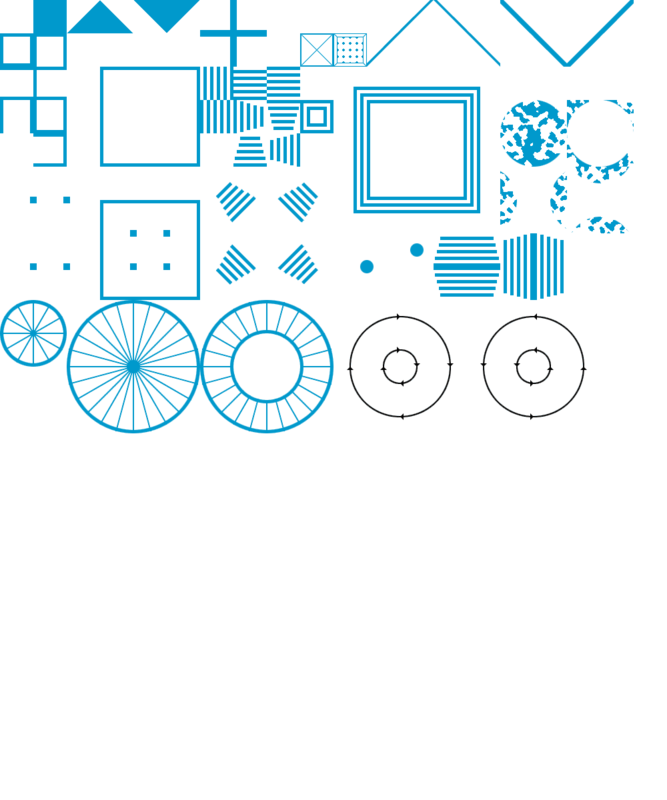 It isn't really designed to do this, but the learning curve is shorter compared to other free vector graphics tools like inkscape or CC3. Once you have a flat map it's trivial to use the isometric camera and Parallel Perspectives options to turn it into a full 3D map. Extra depth can be instantly added by extruding (google calls this push/pull) a short distance, you can even animate the result (Cue spinning Death Star animation). 7/10 - "Who's The Daddy?" 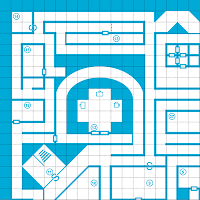 This is a free bitmap level editor (Windows / Mac OSX) designed to create level maps for 2d scrolling games and although it's not designed as an RPG mapping tool it is seriously versatile as it supports an unlimited number of user generated layers. However, you do need to supply it with an image of your tiles to begin with so this tool is more of a DIY approach (ie: if you don't have a good bitmap editor then you'll struggle). 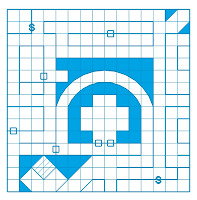 Here are my classic blue tilemaps if you want to try it out (the tilemaps are set at a size of 50 pixels square). 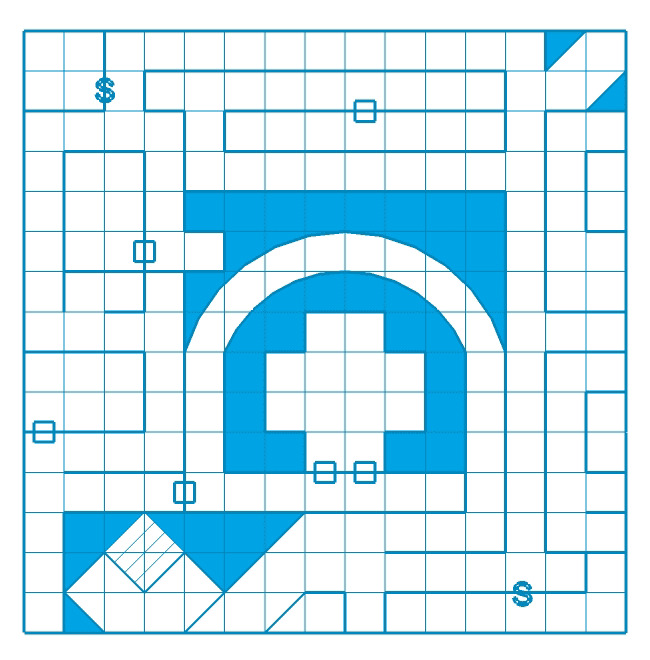 It can do isometrics but I spent far too much time putting the 2d tilemaps together to get round to drawing an iso tilemap, but I'll get there as this tool is just a joy to use. The interface is really easy to learn and if you've struggled with Pymapper like I did try this with my DT1 tilemap. In my opinion this could also easily replace Dunjinni for Battlemaps, and the ability to have all your objects instantly available in the tileset window is infact a big advantage, so no more struggling to locate that one particular tree which you accidentally loaded into the wrong folder. 9/10 - "The future so bright I gotta wear shades"
A Mac OSX native donateware tool ($37 to buy) which has been around for donkeys years. Although the feature set is huge as it has autogenerate dungeons, I found the interface frankly bewildering at almost every stage. The output is also quite primitive in comparison to other free options I tested and given the low pain threshold I have I couldn't even be bothered expend the extra energy to persevere with it beyond the 2d sample. 2/10 - "There's better fish in the sea"
Please accept my apologies if you have been unlucky enough to see sneak peaks of future articles which were inadvertently published in the last 12 hours. Unfortunately there has been a breakdown in the trained humans used, and this will not happen again. My first exposure to the world of Adventure Gamebooks was actually a copy of Weirdworld, a Tunnels and Trolls solo adventure which my dad brough back from one of his trips home whilst working in Durham in the North East of England. I was mesmerised by this crudely made book and I didn't let the mere fact that I didn't have a copy of the T&T rules stop me from repeatedly entering the Madhouse of Maximilian the Magnificent. 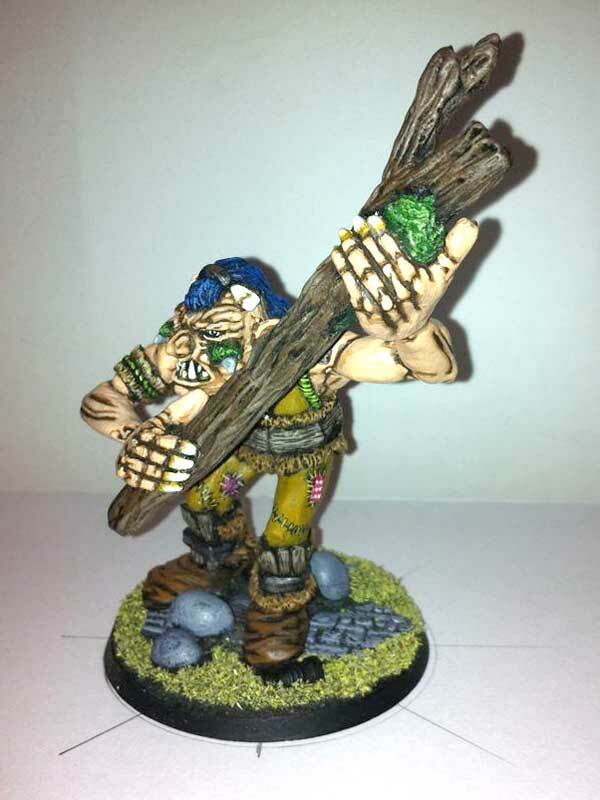 My father (who is to blame for all of this) was a keen wargamer and so I ended up going to the Bradford Wargames Society and being exposed to full blown Roleplaying Games such as D&D and Tunnels and Trolls at quite an early age. 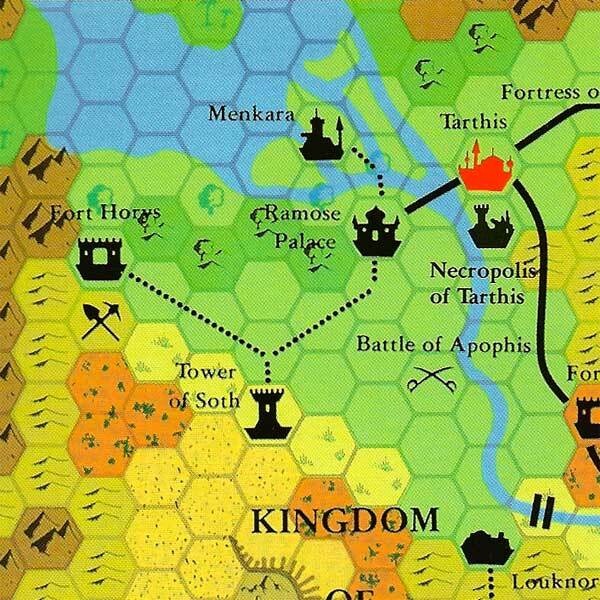 Then came the first great gaming hiatus as we moved away from Yorkshire to South East London. I was already a veteran when the first of the Fighting Fantasy books was published in 1982. Schoolmates who had not already been exposed to RPGs devoured the Fighting Fantasy books with gusto and whilst I enjoyed playing their copies and followed them on their trips to the only gamestore in the area, I didn't buy any of these gamebooks at the time. However, it was on one of these trips that by chance I discovered a copy of the Corgi Tunnels and Trolls rulebook, money exchanged hands and I was now ensconced as the group DM. So although my relationship with Fighting Fantasy is not atypical, I can acknowledge the huge debt owed by UK roleplayers to Steve Jackson and Ian livingstone for setting many of our friends on the path to exploring our own adventures, not just choosing them. Big Blue Bubble Inc have released iOS versions of Warlock of Firetop Mountain, Deathtrap Dungeon, Citadel of Chaos and City of Thieves.